Hello, everyone! I was sitting in my kitchen the other day and thinking if I could share just one recipe, what would it be? I chose this one because it is so easy and flexible! I make this meal in around 10 minutes and it tastes absolutely wonderful! It is flexible because you can use any vegetable in it. For example, if you do not have mushrooms but you have green beans, you can use those instead! 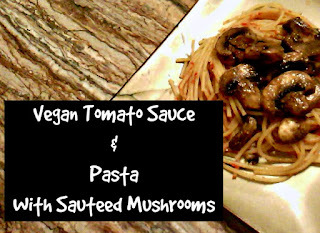 This is your standard tomato sauce recipe, it is very light but flavorful. You can add depth to it by your seasoning choices. 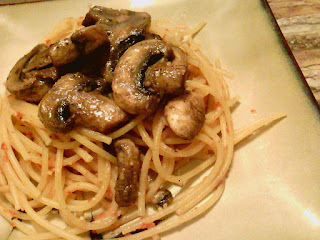 In this recipe, I used Italian seasonings. I could have added cumin and chili powder to have more of a Mexican flavor. In a recipe like this, it is all about the seasonings. That is what makes it so great and flexible. 1. Add tomatoes and chopped garlic to a blender and puree smooth. 2. Add tomato puree to a saucepan and add vinegar, oregano, pepper flakes, and basil. 1. Add butter to warm skillet. 2. Once butter is melted, add mushrooms. 1. Mix pasta and sauce together. 2. If it is still a little watery, let the pasta sit in sauce on low heat until desired consistency.